The Guild GAD-C3 Flamenco Negra Guitar is a classical guitar with real style and flair. With a seductively curvy shape, it encourages intimacy and pulls you in with its smoothly rounded tones. Built with a Hauser Classical shape, the GAD-C3 looks as if it stepped out of the pages of classical guitar history; straight from the hands of a professional Flamenco guitarist and into yours. The combination of solid Sitka spruce top and solid Indian rosewood back and sides lends itself to appealing visual aesthetics with the contrast of the light colored top and the darker back and sides. But not only is this a beautiful instrument to look at, it sounds as good as it looks! The spruce and rosewood wood combination lends the GAD-C3 resonant warmth that saturates your fingertips as you play. 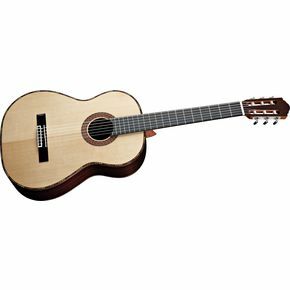 In fact, this is a great acoustic guitar for those who are looking to take up Flamenco, or any other type of intricate classical style playing as the body shape and size is not overwhelming and lends itself well to intricate fingerwork. At ~$849 this is not a cheap guitar. But the GAD-C3 is a great choice for the guitarist who is looking to take up classical guitar, or for the beginning guitarist who is committed to learning how to play classical guitar. Jose Ramirez 125 Anos Classical Guitar which, at ~$2,419 is a bit pricier than the GAD-C3’s price tag. But if you are looking for value and quality, you don’t have to pay more. The Guild GAD-C3 Flamenco Negra Guitar has it all, and more! See more great guitar reviews at Guild Guitar. This guitar is a work of art, looks great. But I'm more into the sound,I was amazed how responsive it was,not too bright or dark, very well balanced in fact. I saw it in a store, didn't need another guitar as I own 5 high grade classicals, but when I played it, wooohh. I went home, and couldn't stop thinking of how great sounding it was.The next day I bought it, I own some expensive luthier made guitars $3k-$4k, this guitar is right up there with them. What a great guitar to own, you wont be sorry if you buy one, totally satisfied. Join in and write your own page! It's easy to do. How? Simply click here to return to Guild Guitar.